Good Housekeeping Award Winner — Designed by space-mission experts — experience the science and thrills of exploring the solar system! Good Housekeeping Game Award Winner–Best Toy Award Winner 2016! Kickstarter Staff Pick! Planetary Society Approved! Do you have what it takes to put together a space mission and race through the solar system? Identify your mission target and put together the right combination of rocket parts and spacecraft to achieve mission success. Watch out for other players as they confound your attempts to launch your mission by forcing you to wait out a government shutdown, swipe your hardware due to higher national priority, or cancel your mission for their own benefit. Don’t worry – you will recover by receiving surplus funds, using extra parts, or even forging a mutually beneficial collaboration with another player. How do you complete your space mission? Each player selects a Mission Card from the deck. This card determines the player’s mission – the mission destination, type of spacecraft needed, the amount of Delta-V needed to achieve the mission, the potential to obtain gravity assists, and the points earned for completing the mission. Delta-V stands for change in velocity, and as applied to space missions and this game, it means the change in velocity necessary for a spacecraft to complete a selected mission. How do you get Delta-V? Delta-V comes from rocket engines and solid rocket boosters, as well as by flying past certain planets and obtaining a boost, known as a Gravity Assist. After selecting your Mission Card, each player receives five Playing Cards. The Playing Cards provide various components needed to complete a mission, such as spacecraft, rocket stages, fairings (the nose of a rocket that contains the spacecraft during launch), gravity assists, and Action Cards. Each player needs to collect the Playing Cards that give them the right spacecraft, first and second stage rockets, and matching fairings. Gravity assist and solid rocket booster cards are available to provide additional Delta-V if needed to complete the assigned mission. Game play is straightforward. On their turn each player draws a playing card, plays an Action Card, and places a component on their game board. The Action Cards add real-life issues to the game that space missions often encounter – project cancellations, audits, government shutdowns, and other exciting twists and turns. To complete a mission you must populate your game board with the right combination of cards for mission success. Each player needs to collect the Playing Cards that give them the right spacecraft, first and second stage rockets, and matching fairings. Gravity assist and solid rocket booster cards are available to provide additional Delta-V if needed to complete the assigned mission. Once the mission is complete, the player earns the points for the mission, which varies based on the size of the spacecraft and the target, and starts work on their next mission. The first player to score 10 points wins. Real space science, engineering, and technology in a fun game for the entire family! We have included a nine-page informational and hands-on workbook with the game. This workbook enhances game play and the educational experience by providing more information about planning a space mission and travelling to asteroid Bennu with the OSIRIS-REx mission. Learn about rocket components, rocket fuel, and picking the best rocket for a mission. At the end, design your own space mission! Each player has their own board, representing an individual launch site at Vandenberg Air Force Base or Cape Canaveral Air Force Station. Boards allow players to track their accumulated Delta-V and total points, place their mission card, and collect the right combination of rocket components, spacecraft, and gravity assists to complete their mission. The Game includes four types of rockets inspired by real launch vehicles such as the Falcon 9, Atlas-V, Delta IV, and NASA’s next-generation Space Launch System. Players need to assemble the correct first stage, second stage, left and right fairings, and potential additional boosters and gravity assists to obtain enough delta-V to complete their space exploration mission. Multiple space vehicles, including landers and rovers, provided. Game includes 29 Mission Cards to destinations across the Solar System including the Moon, Mars, asteroids, and other exciting mission targets Mission Cards indicate which type of spacecraft is required to complete the mission, the Delta-V required, the planets that could provide a boost though Gravity Assist, and the points earned by completing the mission, which varies depending on the size of the spacecraft. We formed Xtronaut to inspire the next generation of scientists, engineers and citizen scientists through space mission-related games and education programs. We were founded by the leader of the NASA OSIRIS-REx mission (launching September 2016, to an asteroid named Bennu), and by a leader in the space tourism sector (organizing team ford first tourist flights on the Soyuz Rocket to the ISS). Space missions, including robotic missions, are about exploration — but who are the explorers in a robotic mission — and what do we call these people? There was no term, so we coined name “Xtronaut”. We encourage interest in space exploration and all types of STEM-related studies by expanding the notion of who is an explorer in today’s world of robotic missions — to include all the people involved in exploration — scientists, engineers, educators, students, and the public as a whole — not just the few fortunate enough to climb into a rocket. This expanded idea of these explorers — Xtronauts — includes the group that designs components and instruments, develops the software, launches the rockets, operates the vehicles, performs experiments, manages the programs, conducts research, participates in the related science, or simply appreciates the beauty of the universe revealed by the probes. Kids become explorers by learning about science and technology! Play our game and become an Xtronaut! Picture: Dante, Mike, and Mike’s son Joshua at Maven Launch at the Cape. 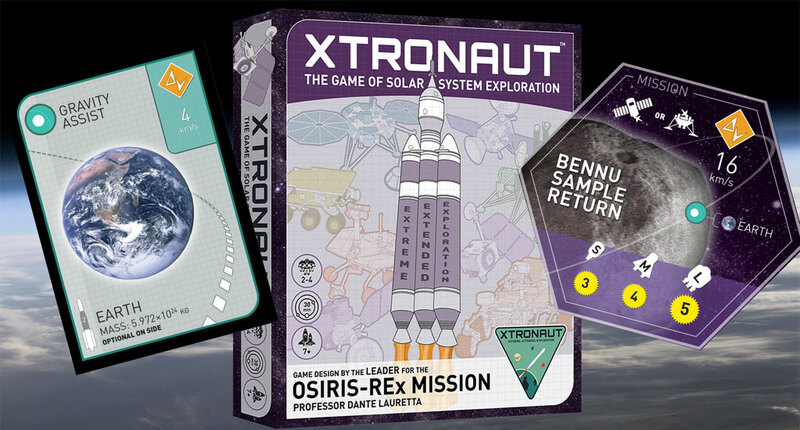 Dante Lauretta led the creation of XTRONAUT by combining two of his passions in life – solar system exploration and strategy gaming. He is now a Professor at the University of Arizona and the leader of the NASA OSIRIS-REx asteroid sample return mission, launching in 2016. We wanted to make a game that captures the various challenges and fun of planning a space mission. Together with Mike Lyon, and many of our fellow rocket scientists and engineers, who are also huge board game fans, we created a game that is grounded in the real world of NASA missions. The result is an exciting game that combines real rocket science with mission planning, strategy, politics, and interactive play. We invite you to join us on this great cosmic adventure – buy the Xtronaut game and begin your journey! Picture above: Dante with OSIRIS-REx and asteroid Bennu models, Mike in Soyuz simulator with Russian commander. No board game combines real-world space mission planning, rockets, Solar System exploration, and technology into an engaging, fun, and educational game. Xtronaut is not a science fiction or fantasy game, but incorporates years of actual space-mission planning and development experience. Both Dante and Mike are space enthusiasts — and believe in the importance of the scientific information and discovery that results from space exploration. But just as important is the impact that space exploration can have on the next generation of scientists, engineers, and the interested and engaged public. We have been gratified by the positive feedback we have had from game players, educators, students, and many others for the Xtronaut game and our education programs.